After a well-deserved big breakfast, we had a quick look around Loja before our night bus to Peru – it will be nice to stay somewhere for a few days! Loja – not a lot to recommend…! 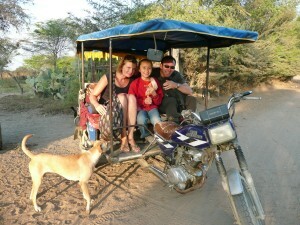 Arrived at Finca Santana, just outside of Chiclayo for a couple for days of horse riding and Moche ruins. Desperate for some decent food, we headed into Pacora in an attempt to find a restaurant, finally locating a basic eating house with plastic chairs and the football on – not exactly what I had in mind…. Managed to convince the lady to cook me fish and Keir bravely decided to risk the set meal, stoically pushing the chicken foot and a few items of unknown, but presumably (hopefully?) avian provenance, in his soup to one side while he ‘enjoyed’ the remainder of his soup. I think he would say that it was an ‘interesting’ lunch. 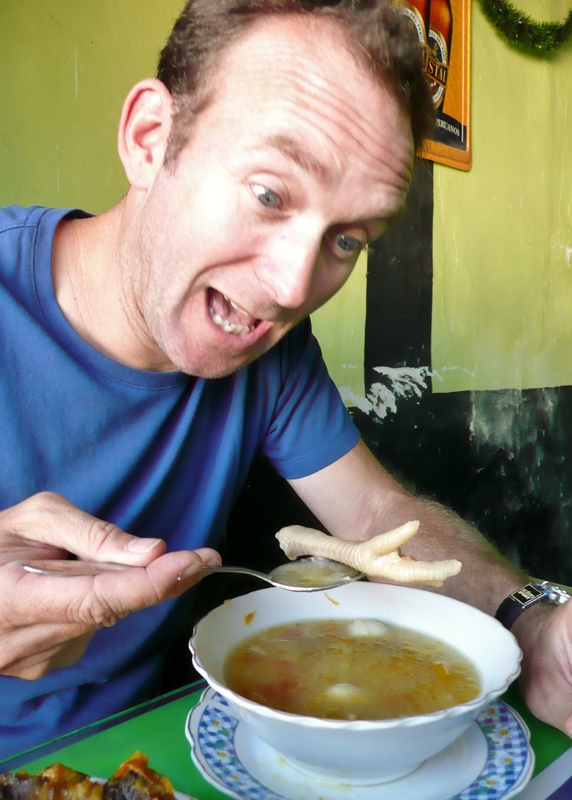 Chicken foot (& other ‘sweetmeats’) soup was interesting… not sure we’ll be going back there! Ranch is basic but lovely – lots of horses, dogs, cats, ducks, chickens, etc… inc. lots of little cute babies animals for T to coo at! 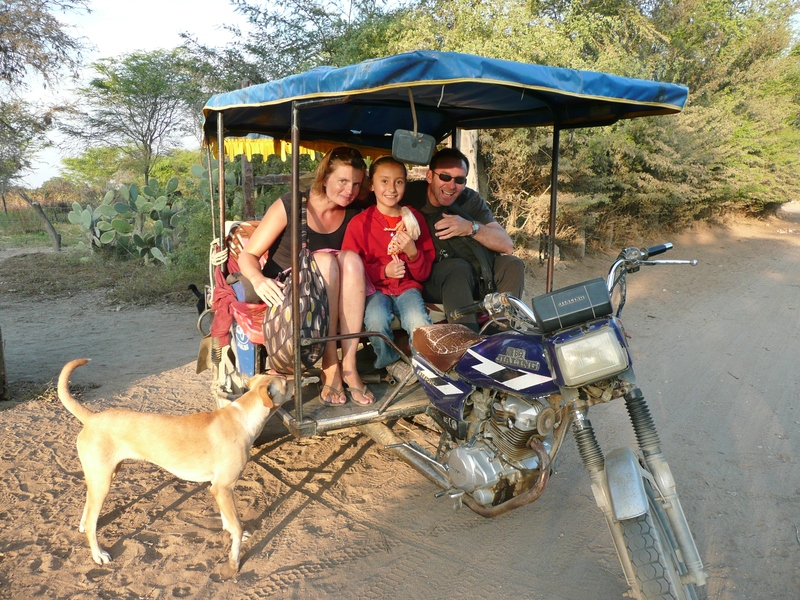 Off for a 5 hour horse ride to the Moche pyramids today – good, but dusty, fun. I am actually feeling much more comfortable on a horse now, but I think it is just that these Peruvian Paso horses are so nice to ride. 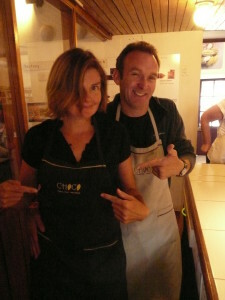 Andrea (the owner of the ranch) kindly cooked us lunch – fish for Keir! – thus saving us from the dubious pleasures of sourcing another meal from the town. Flushed from our lucky escape, we decided to go into town in the hope of getting a drink, this turned out to be rather more difficult than expected, and we returned home with 2 bottles of beer and a bottle of sweet red wine, not great, but I made a valiant attempt to drink half a bottle of the latter before slumping into a mildly dejected slumber. 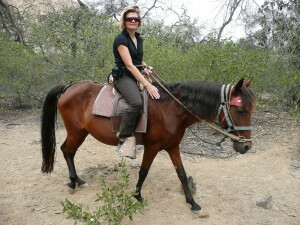 Horse riding was perfect – the Paso horses do a very long version of trot which makes sitting trot very comfortable. T did really well on the horse, the ride was lovely – the pyramid was a pile of mud basically, but with great views from the top. Nice to be around animals though & Manuel, Andrea & her daughter Joceline were lovely. They are building a new house, so I gave them an hour or so hod-carrying mud bricks… good to do some physical labour. We went to the Museo de Tumbas Reales in Lambeyeque to see the contents of the Lord of Sipan tomb today, sadly not allowed to take pictures, but the museum was pretty amazing (and this from someone who is not a fan of such institutions), it almost made me wish I was an archaeologist. Nipped into Chiclayo afterwards for some much needed delicious food (con cuba libre), to wait an hour outside Banco de la Nacion for the pleasure of paying for our Machu Picchu ticket – I was extremely grateful to the entrepreneurial lady selling freshly squeezed orange juice in the queue – pay for Keir’s Nazca flight, and buy our bus tickets for Lima tomorrow. The museum was cool, the gold & copper work was amazing. The queuing later, less so… but then it was all for me, so can’t complain! 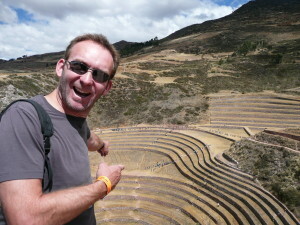 A lovely outing through the fields to an Incan fortress – 6 concentric walls up the side of a hill. The difference between the normal geography & the irrigated fields was just amazing… a desert with green oases dotted around the horizon. Loved the horses… reminded me of what I’ve been missing. T was again a trooper, although her thighs & knees were starting to become a bit sore. Narrowly avoided heart attack when we discovered that we had arrived in Lima, but that our rucksacks had not. Fortunately Civa managed to locate them in a different Lima bus terminal and sent us off in a cab to fetch them; very, very relieved. Amazingly, and contrary to my memories of the place, Lima was free of garua (smog) today and we had a lovely sunny day!.After an extraordinarily expensive breakfast in Starbucks – we were desperate – and a mini-self-conducted tour of the city (especially liked Monasterio de Santo Domingo), we finally managed to get into our hostel for a shower, see the fountains in the park, and have a fantastic, if not particularly cheap, dinner in Tanta. The first loss of luggage was a little bit tension inducing! :) Especially as it was on one of the most expensive bus rides we’d taken. We were amazingly phlegmatic about it; I was just waiting for T to go nuclear on them but all was resolved very quickly. Lima was quite nice, but not a ‘wow’ city. Breakfast and then Nazca – another 8 hours on a bus – hooray. More bus time & more reading time for me… I’ve read about 70 kindle books (inc Lonely planets) since we started. My way of exiting from reality & taking some ‘me’ time – T not greatly happy when I do this. 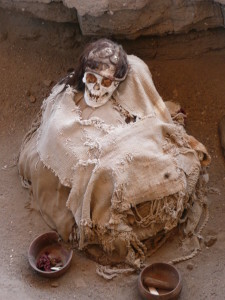 After the flight we took a taxi to Chauchilla cemetery to see the mummies with hair :), then blogged, ate, and caught the overnight to Cuzco. It is supposed to be very cold, have all my spare thermals with me! Can’t say that I was at my happiest re the flights – they weren’t greatly organised… but we managed to sort it out. I’m pleased I saw the Nazca Lines but I wasn’t blown away by it. Still, another S America ‘must see’ ticked off! (T will kill me for saying that!!). So much for cold, I had a burning hot radiator at my feet half the night, with intermittent 5 minute intervals of high level cold breeze to cool me down. Strangely the front of the bus was a lot cooler… Finally arrived in Cusco at 2pm, for a little look around in order to establish that my favourite jewellery and clothing stores are still around :) – shame I cannot buy anything. Cusco was lovely and sunny, but our hostel is freeeezing! 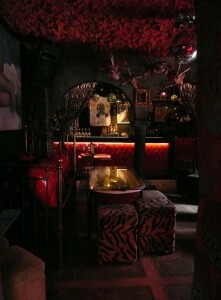 Great dinner in Marcelo Batata, cool black & red décor too. Another night bus, another city…. I’ve now had Alpaca steak (v nice) but have yet to try the Guinea pig – maybe in the next few days. Slept really badly and felt sick all night, a bad sign as we had to get up at 4:45am for Machu Picchu; yuck. Both had a bad night’s sleep but Machu Picchu made up for it. 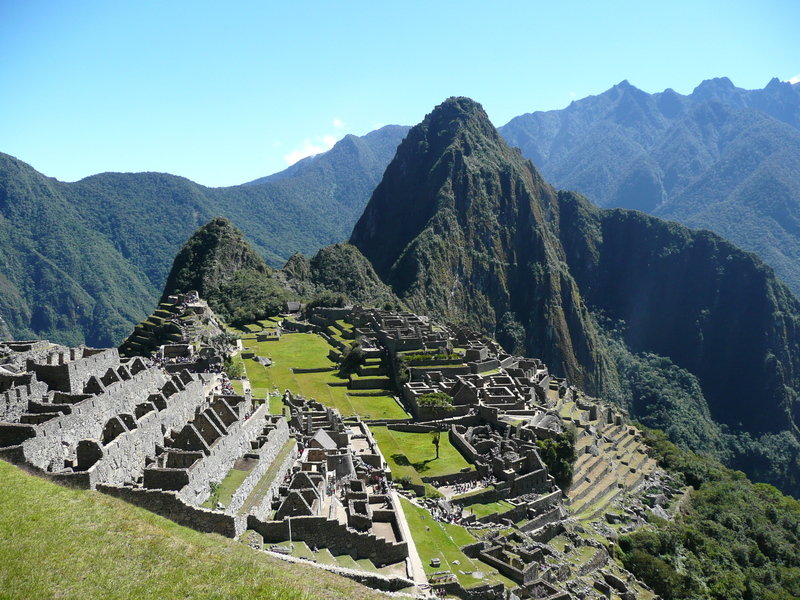 Beautiful sunny weather, stunning mountainous peaks, gaping chasms & amazing Incan architecture…what more can you want? Apart from dancing girls & beer on tap, of course. Incan stone work is just amazing; not quite sure why it has such a ‘jigsaw’ style construction, but all the pieces (some of which are huge) fit together with almost laser like precision – no mortar required here. Roll on reconstructing my ‘castle’…! Happy we made this ‘must see’ site, but even more happy that we did it by train & not the 4 day trek – b*gger that for a game of soldiers! Finally, a lie in! It was slightly disturbed by being woken up at 4 in the morning by a returning tour group. A gentle day of sight-seeing & wandering round Cusco (even turned down the opportunity to see another fort… obviously unwell ) rounded off by visiting the restaurant that T has been talking about since even before we started the trip. I’ll let her describe it, but it met all expectations (including cost!). Walked up to Sacsayhuaman to find we had to pay 70 sol to get into that and 3 other sites that we were not really interested in seeing, decided to save the money for a chocolate making course on Thursday instead. I felt inexplicably suffused with excitement for the rest of the day. A day trip out firstly seeing an Incan ‘laboratory’ at Moray where concentric terraced steps go down 150m into the ground. The combination of the evaporation from the limestone geography & differing altitudes of each terrace means that they each have unique micro climates suitable for growing particular types of crops. A quite impressive site made more enjoyable by the lines of 100’s of Peruvian school children lining the terraces practising an Incan ceremony. Then we headed to the Salinas salt flats where 100’s of small pools of naturally salinated water evaporate in the dry season to create natural salt… the photos don’t really do it justice; you suddenly turn the corner of a dry, barren & dusty landscape to be confronted by this sight – check out the photos. Maras, Moray, Salineras, pub quiz; which we bizarrely managed to win, despite being the smallest team competing… I am unsure if this was an age-related phenomenon, or just lucky guesswork. In any event we scored a bottle of Argentinian (rather than Peruvian) wine, which we nearly lost when wandering insouciantly into the backpackers hostel brandishing it, oops, I forgot that we couldn’t bring booze in, luckily the man was very nice and suitably impressed with our achievement! The highlight of today was going on a chocolate making course… I won’t say anything else (as T will wax lyrical about this), but it was great fun & most importantly – chocolate with high percentages of Cocoa are good for you – FACT (as a certain Bignoseo might say!). You heard it first from me – so start stuffing your face with 70%+ dark chocolate… I know that we already are . Oh yeah! Mum, I am going to buy you a chocolate making course, you will love it! So, the Choco museum, where the lovely (and very amusing) Gladys showed us how to grind cacao beans, sing whilst whisking and (rather alarmingly) got me to volunteer for an unknown activity which entailed her donning a pair of latex gloves and then unnecessarily walking behind me…, before finally letting us loose on the molten chocolate and moulds. There was much licking of bowls and surreptitious consumption of chocolate ingredients involved. Highlights included Keir singing a Sugar Hill Gang classic and the Aussie Lilia explaining to our German contingent, Pacul, the meaning of a suppository. Priceless.